I hope you’re sitting comfortably because this video series runs and runs! 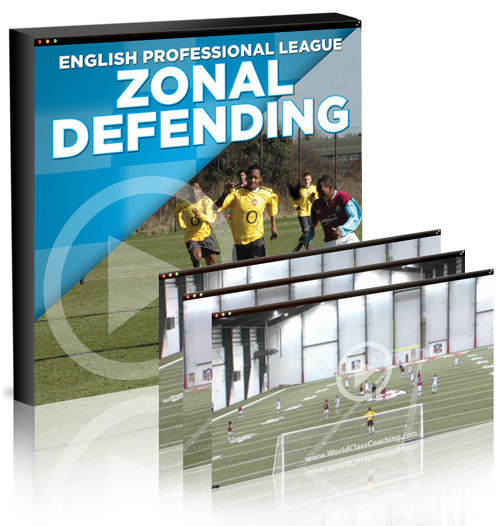 English Professional League Zonal Defending features a complete and extensive 16-part video seminar on how to train your team to replicate the wall like defenses of the best English Premier League teams. Comprising of 16 videos spanning several hours in length, this special video series provides arguably the most comprehensive video guide yet on training the zonal defense. Zonal defending is used by teams all over the world, but few play it as effectively as the English Premier League sides. Manchester United, Arsenal and Chelsea are renowned throughout Europe for having some of the toughest defenses to get past. Now you can unlock the secrets on how English teams create wall in front of their goal and how you can create one of your own to keep opposition players outside of the box and reduce the risk of goal scoring opportunities. English Professional League Zonal Defending features a complete coaching session from start to finish, filmed at a WORLD CLASS COACHING International Coaching Seminar. Former Manchester United U18 coach David Williams covers every aspect of the zonal defense system, from theory and mindsets through to practical drills and team training. Get instant access when you place your order and you can be watching these videos within minutes. Starting with drills for coaching the back four through to incorporating the midfield, defending as a team and then ending with systems of play and tactical adjustments, this special video series is comprehensive in its analysis of training a zonal defense. The result is that you will have a complete set of drills for improving the zonal defensive qualities of your team so you can force opposition teams to try their luck from outside the box and protect your lead until the final whistle. The best teams are able to transition smoothly between man marking and zonal defense to suit the stage of the game. When you’re a goal up and want to lock down the goalmouth from runs into the box then zonal defense is always the more effective choice over man marking. Playing a zonal defense enables you to keep the ball outside the box, to slow down the tempo of the game and to force the opposition to shoot from range. It’s also less tiring to play, making it ideal for the final stages of the game when you are protecting a goal advantage. 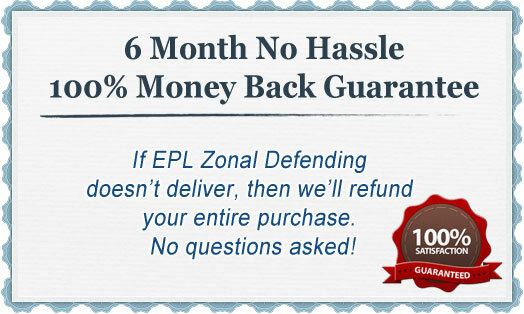 English Professional League Zonal Defending shows you exactly how to train your entire team to play a zonal defense. From the roles and responsibilities of defenders to controlling the midfield through to playing with high or low pressure, everything is covered in this comprehensive video series. So if your team is leaking goals like a sieve, now you can discover how to prevent opposition attacks and to protect your goal lead until the final whistle by watching English Professional League Zonal Defending. David Williams began his career in soccer as a midfielder for Bristol Rovers. When his playing career ended he swiftly moved into coaching and coached at several English Premier League clubs, including Leeds United, Everton and at Norwich City. 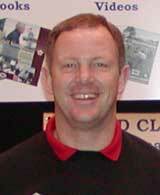 Most notably, Williams spent over five years as the Academy Director at Manchester United and as their U18 Team coach. 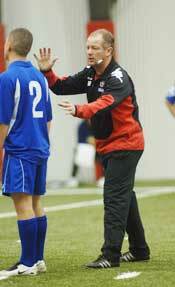 Williams also has international experience as assistant coach for the Welsh National Team. After leaving Manchester United, Williams then returned to Norwich City to become the Director of their Academy and was voted into Norwich F.C.’s Hall of Fame in 2002 in recognition of his contributions to the club’s success. English Professional League Zonal Defending features 16 videos detailing how to train your entire team to play a zonal defense in a progressive manner. It starts with 1v1 drills before gradually adding more players and positions until you have an 11v11 training session for the entire team. Williams begins the session with a 1v1 warm-up, which teaches players how to close the distance and to engage opposition players in a way that keeps them guessing which way to take the ball. It also teaches defenders to predict what attackers are going to do based on their first touch. Drills are progressed to a 2v2 then a 3v3 and finally a 4v4 across the width of the pitch. During this section, Williams explains the roles and responsibilities of the back four in a zonal defense and the key principles of pressure, cover and balance. The session then advances to include midfielders. Williams explains how the two lines work together when in defense to force opposition players into wide positions and away from the box. A number of drills are provided to solidify the understanding between the back four and midfield so they know what to do in the event that defenders are pulled out of position by opposition attacks. For zonal defenses to work effectively the whole team has to contribute – this includes forwards. This part of the session shows you how to add forwards to zonal defensive training and their importance in defending as a team. Williams sets up an 8v8 game to demonstrate and train zonal defense, with the game played in three zones and includes overload situations and adjustments should there be a breakdown or loss of shape. The final part of the session covers the options you have for defending with high or low pressure. This includes the specific features of playing a zonal defense in a 4-4-2 or a 4-3-3, as well as the factors to consider when playing teams using these formations. Finally, Williams covers the options for defending against corner kicks and free kicks, where teams without proper training can be exposed. If you want to play a zonal defense then the best teams to learn from are those in the English Premier League. Former Manchester United Academy Director and Under 18 coach DavidWilliams shows you how in this comprehensive video series. Grab a virtual pitch side seat and watch how to run a progressive training session that trains your entire team to play zonal defense, from a 1v1 situation right through to playing 11-a-side. Whether you coach university sides or elite players, every team needs to be able to adjust its tactics to suit the stage of the game. Enriching your understanding of how to train a team to play a zonal defense will enable you to create a team that’s better prepared to defend a lead and to force opposition sides to shoot from distance. English Professional League Zonal Defending shows you exactly how to do it and how to drill your players in the mindset and skills to play a zonal defense effectively like the top English sides. WORLD CLASS COACHING is recognized globally for the quality of its soccer coaching resources, which are used by over 40,000 soccer coaches from around the world. We wouldn’t be offering you English Professional League Zonal Defending unless it achieves our exceptionally high standards. However, if you are not 100% satisfied with the quality of English Professional League Zonal Defending after six months then please contact us for a no quibbles refund. It’s been proven many times that teams with solid defenses can grind down teams that rely on flair. When your goalmouth is protected, your forwards are under less pressure to keep scoring to win you games. This is why so many teams rely on a zonal defense to block out opposition forwards from probing into the box and forcing them to take pot shots from distance. English Professional League Zonal Defending covers everything you need to know about creating a team that’s able to divert opposition attacks and to force them to play the ball where you want. From 1v1 drills that teach defenders how to engage forwards through to drills that test the back four line right through to drills for getting the whole team to play as a defensive unit, every aspect of playing a zonal defense is covered over the course of 16 videos. So if you’re fed of seeing the ball being picked out of the back of your team’s net, discover how to harness zonal defending like the best English sides in arguably the most comprehensive video series on zonal defending out there. P.S. English Professional League Zonal Defending is a comprehensive video series featuring a complete training session led by a former Manchester United Academy Director and Under 18s coach. It covers every aspect of creating a solidified zonal defense, from training your players to engage effectively 1v1 right through to creating a zonal team defense. P.P.S If you are not 100% satisfied with the quality of the soccer coaching resources in English Professional League Zonal Defending after six months then we will refund your purchase in full, no questions asked.